Many iPad users rely on the default way of resetting their iPad i.e. using device's settings or iTunes. However, there are lots of users who keep on doubting if there's any way to wipe an iPad without passcode when their devices were disabled. Well! If the same question is going through your mind, let us inform you that there's a way through which you can fulfill this motive. We are going to introduce this best yet convenient way that will certainly help you to learn how to wipe an iPad without passcode. Also, we will be sharing some useful information about wiping iPad that you must know. Before you learn how to wipe an iPad without passcode, you must know the reason that pushes you to have the iPad get wiped for that matter. So, there is a list of reasons essential to wipe your iPad. We have collated a list about the most common reason. While giving your iPhone/iPad to the Apple store for fixing some software glitches. While selling off or giving away the mobile to a friend or a third person. If your iPad/iPhone is disabled. If your iPad/iPhone is screen locked and forgot the passcode. Wipe old iPad/iPhone from friend but forgot the passcode. If your iPad/iPhone is lost and the data might be misused. If iPhone is not responding properly or frequently hangs. Some buggy app is running your iPhone's performance. Once you understand why wiping out iPad without passcode is essential, before carrying out the wiping process you need to remember the precautions too. Most of the time, wiping out a locked/disabled iPad is tough, but there are cases when you can do that with ease. Ensure to back up your device data, as the processes delete everything. You can back up your iPad on iCloud or iTunes depending on the need. You need to be logged into iCloud on your iPad. Ensure to note down your Apple ID credentials, as you will need it to configure your device and restore the old data. Note down all your social media and email account login details. Your iPad needs to be synced with iTunes otherwise you can't use iTunes for wiping iPad. In other words, the iPad needs to be used with a pre-trusted computer, so that the need to key in the passcode can be avoided. Have you wondered how to safely erase your iPad without any passcode? Tenorshare 4uKey is the ultimate solution to understand how to wipe an iPad without passcode. When you are unsure of the most effective way for erasing your iPad or factory resetting a locked iPad without password, Tenorshare 4uKey shows you the easiest and foolproof way to do so. It is capable of unlocking password forgotten iOS devices, even if you have a digital lock or Face ID or Touch ID. It even supports the latest iOS devices and the fresh iOS version as well. Whether you have a Mac or a Windows computer, this software can run on both of them flawlessly. Moreover, factory resetting your device is a smooth walk with this software. Step 1 First and foremost, you need to browse to the official website of Tenorshare 4uKey. Once the software has been downloaded from the site, install it properly on your computer. Run the program once installation has been done and then connect your iPad through a lightning cable. Tap on 'Start' button after the connection has been established. Step 2 Now, you need to press the 'Download' button and let some time pass. It will ensure that the iOS firmware is properly downloaded on your iPad without any glitch. Step 3 Hit the 'Start Unlock' button after that. It will 'factory reset' and unlock your iPad without a passcode. This is how to wipe an iPad without passcode using 4uKey. Step 4 You can now, configure your iPad passcodes. 4uKey allows you to restore your iPad/other iOS devices using existing iCloud or iTunes backup files. From the above article, we are confident that you have got the hang of how to wipe an iPad without passcode. The gist of the article is, Tenorshare 4uKey won't leave you stranded when you need to unlock a passcode forgotten iOS device, perform factory reset and bring everything back to normal, which is practically difficult for any other software available in the market. 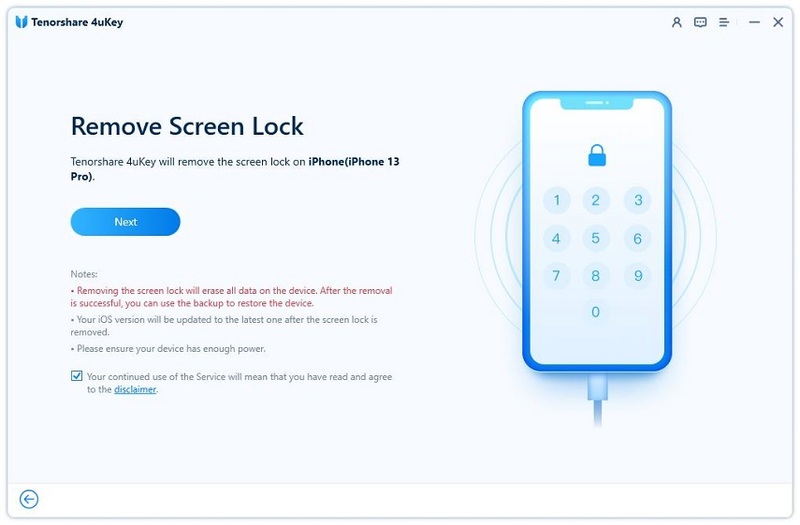 In case your iPad or iPhone stops responding to passcode inputs, you can simply use this tool and bypass the passcode while erasing the device and see things work for you.